No matter what type of business you have, Hawaiian Cool Water has a Hi2O water purification solution that can be tailored specifically to your needs. One low monthly fee. No fluctuating bottle fees or delivery fees, ever. Healthy, well-hydrated employees who are productive and alert. Eliminate workers’ comp risks associated with lifting 42 lbs. water jugs. You’ll never run out of purified water, so no waiting on delivery trucks for water jugs or cases of bottled water. Flexible placement options; anywhere within 200 feet of a water source. 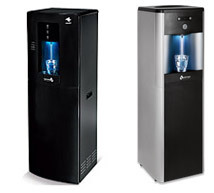 With understated, elegant designs, our Hi2O free-standing systems dispense clean, refreshing water around the clock, without the bulk (and hassle) of the 5-gallon water jug. Serve customers delicious still and sparkling water, and better-tasting coffee and tea, with a Hi2O countertop purification system. Sleek dispensers sit nicely behind service counters, while their cutting-edge filtration units work discretely underneath. 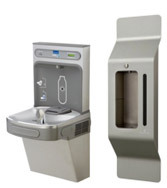 Purified water fountains and bottle filling stations give all your patrons-those with and without their own bottles—with cold, clean, great-tasting water.